Mammoths died, and farmers domesticated pumpkins, squash, and gourds. (Inside Science) -- As you enjoy your pumpkin pie this Thanksgiving, be sure to give thanks to ancient North American farmers. They domesticated pumpkins, squash and gourds 10,000 years ago, and if it weren't for them, there probably would be no butternut squash, no zucchini, no Jack-O-Lanterns and no pumpkin pie. Instead, all that might exist today would be a few tough, softball-sized, bitterly toxic fruits. "We co-evolve with plants in such a way that they're useful for us and we fill a niche for them," said Logan Kistler, an anthropologist at the University of Warwick in the U.K. "Something inedible in the wild can be made edible and delicious in domestication." The domestication of these fruits, which belong to the genus Cucurbita, is the focus of Kistler's new study. It paints a sweeping, 10,000-year history connecting humans, the rise of the pumpkin, and the fall of the mammoth. "These are plants that are adapted to a landscape with large mammals," said Kistler, whose team published the research November 16 in the journal Proceedings of the National Academy of Sciences. "As large mammals disappeared, some of [the plants] adapted by partnering with humans." Before humans began domesticating Cucurbita, the wild, bitter species were found across North America — a source of food for large mammals like mammoths, mastodons, and ground sloths. The animals munched on the gourds, spreading the seeds through droppings. But when large mammals started becoming extinct, wild Cucurbita dwindled. The reason Cucurbita was so reliant on large mammals, the researchers hypothesized, was that only the big beasts could stomach the fruit's toxic bitterness. For smaller mammals like mice and shrews, Cucurbita was inedible. Because they didn't eat it, they couldn't disperse the seeds. The ability to taste and consume bitter compounds seemed to be related to animal size. A mouse was so small that a couple nibbles of a toxic squash could be lethal, forcing it to evolve a heightened sensitivity to bitterness. A mammoth, on the other hand, could tolerate a much larger dose and didn't need to be as sensitive. To test this idea, the researchers scanned the genomes of 46 modern mammals ranging from a mouse to an African elephant, looking for TAS2R, a gene that codes for bitter taste receptors. They found that indeed, the smaller the animal, the greater variety of bitter-taste receptor genes it had, and the better it was at discerning -- and thus avoiding -- bitterness. The disappearance of big mammals had another harmful effect on Cucurbita, Kistler said. Cucurbita are weeds that thrive in disturbed habitats like a patchy field trampled over by mammoths. Without these ambling giants, Cucurbita lost places to grow. The plants' future, it seemed, was bleak. Fortunately, the fruit found a new mammal to rely on: humans. People had been using wild gourds for containers and possibly even floatation devices for fishnets. But over time, they began eating the fruit, replanting the ones that were most palatable. Eventually, over thousands of years, the fruit evolved to become mild and tasty -- and now icons of the fall season. 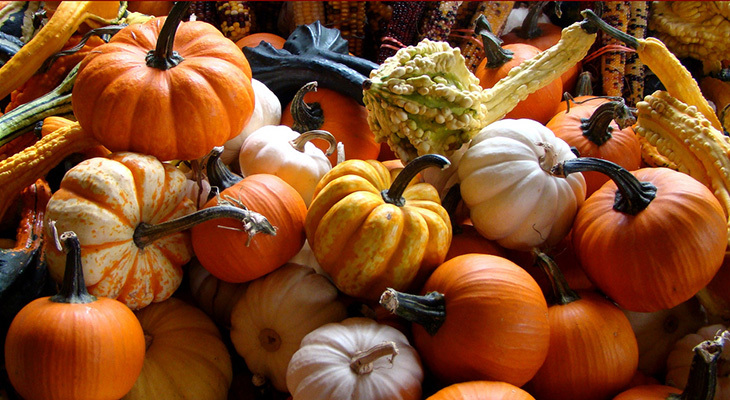 Scientists have previously known that Cucurbita was domesticated. But to gain more insight, the researchers analyzed the genomes of ancient Cucurbita samples -- bits of seeds and rind -- found in caves in places such as central Mexico and the Ozark Mountains in the central U.S. The genetic patterns of the samples reveal human agricultural fingerprints all over the plant's evolutionary history. "Domestication was a widespread phenomenon," Kistler said. In particular, the genetic evidence suggests people living in what's now Arkansas developed their own distinct subspecies of squash. That contradicts conventional wisdom, said Gayle Fritz, an archaeologist at Washington University at St. Louis, who was not involved in the new study. Most scientists had previously assumed all squash were domesticated in Mexico or Mesoamerica. But what sets this study apart is that it reaches so far back in time. "I don't know of many [other] examples of plant domestication that take such a deep temporal view -- in this case, even the pre-human occupation of the western hemisphere," Fritz said. Such a historical view underscores the fact that even domesticated crops are part of a constantly changing ecosystem. "It's worth thinking about domestic plants as a species in a symbiotic relationship with us," Kistler said. "Ecology is still changing, the climate is still changing. And as these changes occur, plants are going to respond -- and they're not necessarily going to respond in ways that are exactly what we have in mind or what's most beneficial for us."